Wildlife and waterfalls – from Victoria Falls World Heritage Site to game drives and river cruising in the Chobe National Park. This week long safari has it all. plenty of free time to explore Africa’s adventure capital. Get a buzz out of the adrenaline filled activities… white water rafting, bungee jumping or perhaps a micro-light flight. Or keep your feet firmly on the ground with a visit to the market and high tea at Victoria Falls Hotel or a round of golf followed by a little relaxation at one of the excellent spas – Victoria Falls has it all! the Safari Lodge has a pool and spa and overlooks a waterhole, the perfect spot to sit and watch the animals – including warthog, antelope plus many different species of birds… sunsets are spectacular too! game drive through the National Park takes us to the Chobe Bush Lodge right next to the Chobe River, close to the point where Botswana, Zambia, Namibia and Zimbabwe meet. An excellent base for exploring the region. Chobe Bush Lodge is new, spacious and modern with luxurious rooms and views over the Chobe National Park. Spend 3 nights at the Lodge with breakfast and dinner daily, games drive, 2 hour private boat trip, river cruise, cultural visit to a Namibian village. April to early November – best time to avoid the rains (end of November to the end of March). Delve into Africa's adventure capital at Victoria Falls - the #1 sport for adrenaline junkies or just relax with a sunset cruise. Did we forget to mention you're staying in one of the top 10 Resorts & Safari Camps in Africa – Conde Nast Traveler magazine? Met on arrival for transfer to the Lodge and check in. Sunset cruise on the Zambezi River, sipping drinks as the sun sets. Early rise to see the animals drinking at the waterhole from your room. Tour of Victoria Falls. 'Vulture Culture' lunch, Dinner at the Makuwa-Kuwa Restaurant. You're free to explore Victoria Falls today returning for Dinner at the Boma-gourmet food with traditional dancing and entertainment. 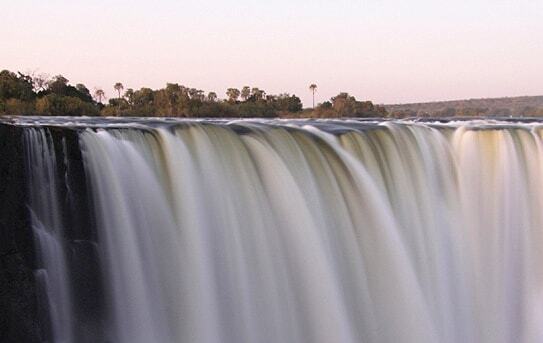 Leave Victoria Falls, game drive transfer to Chobe Safari Lodge, Botswana (2.5 hrs.). Arrive check in and relax. dinner in the evening. You have a number of included activities which you're free to do whenever you wish - River boat cruise, private boat cruise, game drive plus 2 additional activities. Breakfast and dinner daily. Leave Chobe for Victoria Falls to continue under your own arrangement. Please advise your Zambezi consultant if you wish to extend your trip or would like us to book your flights for you. By air from Johannesburg, Harare or Lusaka. By road through Zambia, Zimbabwe, Botswana or Namibia. Please ask you Zambezi consultant if you would like us to assist with your flight bookings. "My safari booking with Zambezi exceeded my expectations!" 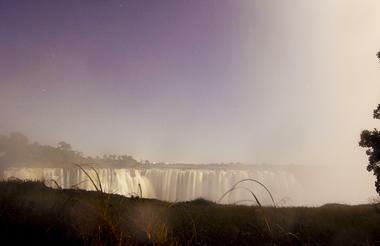 "Victoria Falls – April Hi Mark We are back home. We had a great time; wonderful people, helpful, good food and fun. Daniel"
"Hi Liz, We just arrived home today, You are by the best travel agent I have ever worked with! Your knowledge, service and speed to rectify any issues we encountered was"
"We had an amazing time – thank you Liz A big THANK YOU LIZ from us both for all the effort you put into organising our trip we had with"
"Thank you, Ang! We had a wonderful time on our honeymoon. Everything was perfect and we didn’t have to worry about a thing. You were very helpful, flexible, and attentive." "Hi Ang, Just want to let you know that my husband and I thought this trip was outstanding! First of all, all the flights were on time. 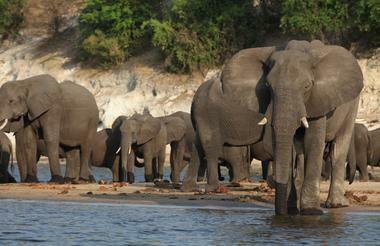 We were a"
Chobe is home to the highest concentration of elephants in Africa during the wet and dry season. It's renowned for impressive buffalo herds which sustain a very healthy population of lions. Zebra warthog, kudu, impala, wildebeest and a variety of other game are prevalent. And... the local bird list exceeds 450 species!